Dimensions 0.10 by 8.25 by 10.75 in. APEEC is the first measurement scale designed to evaluate the use of developmentally appropriate practices in the early elementary classroom (KÃ¢ÂÂ3). Developed for classrooms serving both children with and without disabilities, the APEEC can be used by administrators and researchers to evaluate the degree of developmental appropriateness in inclusive and general education classrooms. It can also be used by teachers as a self-assessment tool. The book includes a carefully thought-out score sheet, which can be photocopied for use in rating classrooms. Featuring straightforward language and an easy-to-follow format, APEEC is organized under three main categories: Physical Environment, Instructional Context, and Social Context. 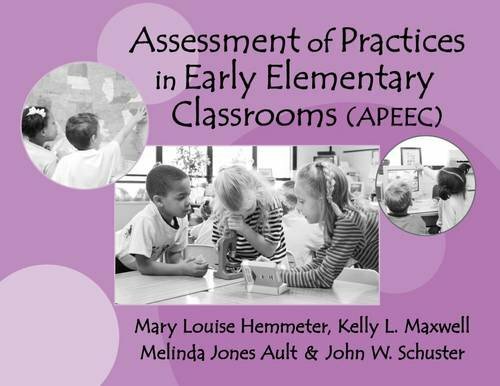 The authors used a multi-step process to develop the APEEC, including a thorough review of the relevant literature (particularly the NAEYC guidelines and early childhood special education literature); an extensive review of the scale by practitioners, researchers, and board members of professional organizations and research journals; and field testing in 69 classrooms. About: APEEC is the first measurement scale designed to evaluate the use of developmentally appropriate practices in the early elementary classroom (Kâ3).